Cooks are probably the lifeblood of a restaurant since it will never do without someone to cook and prepare the meals in the menu. 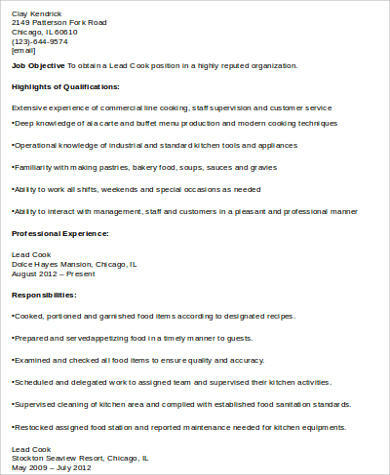 The term cook is pretty much a general description since there are a couple of cooks in a kitchen staff. 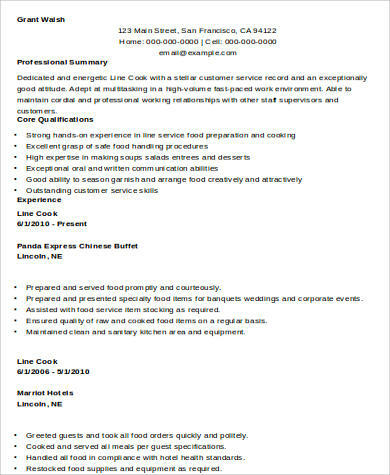 The head cook is recognized as the executive chef and the generically-termed cook is always recognized as the mid-level line cook. 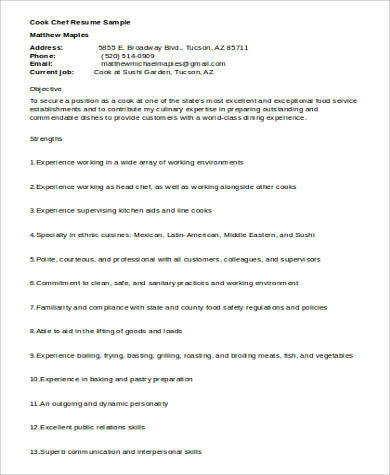 Our Sample Resumes have several descriptions of a cook’s position, and these will help prospective applicants for the position choose the best form. 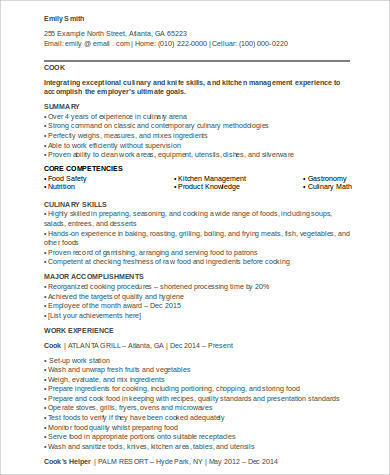 These are all available for download and print and can be modified or edited according to specifics in your resume. Typically, a cook will cook for and prepare meals for a lot of people, and the pressure that goes along with it may not be for everyone. The constant washing, chopping, and partially cooking of meals go on and on at all hours, especially on busy restaurants, and these afford little rest. 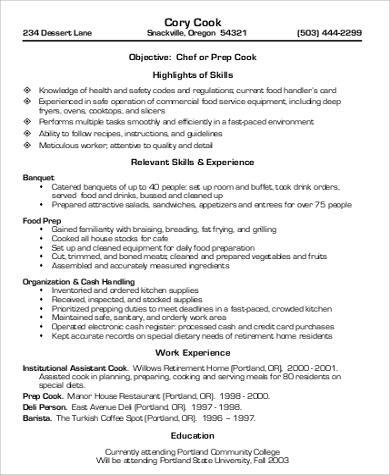 It’s not an easy job, but depending on the restaurant or hotel that employs you, the trade-off might be a good-paying job. developing new recipes and seasoning to make the food taste great. It’s not unusual for cooks to suffer cuts and burns in the kitchen even if safety measures are in place. Cleaning up on and after the shift is always being emphasized to prevent food-borne diseases from contaminating the meals being served in the kitchen. It would be quite disastrous for a restaurant if customers get sick. Such mistake could mean the restaurant’s reputation could suffer and customers may stop coming as a consequence. 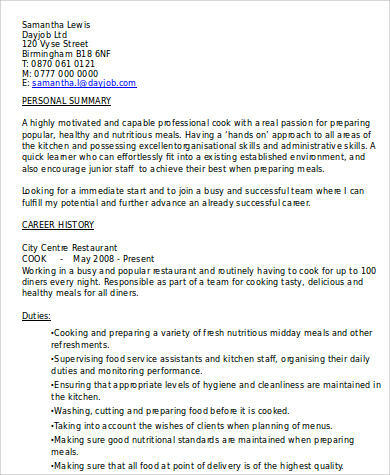 Our website also offer Sample Restaurant Resumes for those looking to work in a specified field. These are also available free for downloading and editing according to your own specific objectives, tasks, and experience. Kitchen work depends on teamwork, and as such, a lot of people are involved in the kitchen. However, there may be times when one of the teams is absent and one of the cook’s responsibility is to fill the station left by the absence. A cook has to be prepared at all times to assume responsibility and should be capable enough to handle any kitchen emergencies that may emerge from time to time. 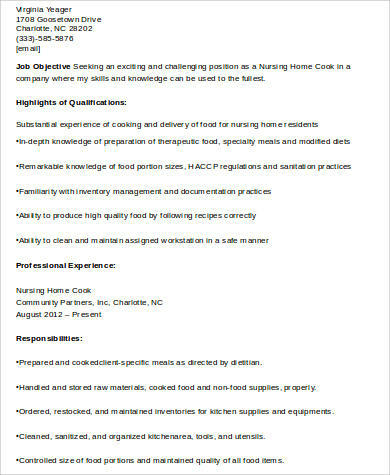 Besides cook resumes, we also offer Sample Chef Resumes for those who are qualified chefs. 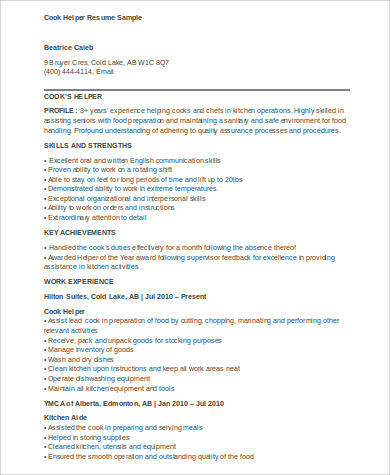 The wide array of job descriptions and samples to choose from may mean applicants can create their own resume according to the exact outline they can use as examples.